A single sheet of yellowed onion-skin paper sits atop a table in the Special Collections reading room at Skillman Library. Dated June 22, 1877, the paper tells the story of a book presented to the College by Rev. James Long Scott. Born in Coatesville, Pa., Oct. 27, 1812, Scott graduated from Jefferson College in 1833 and Princeton Theological Seminary in 1838. He served as a Presbyterian missionary in India from 1839-1880. 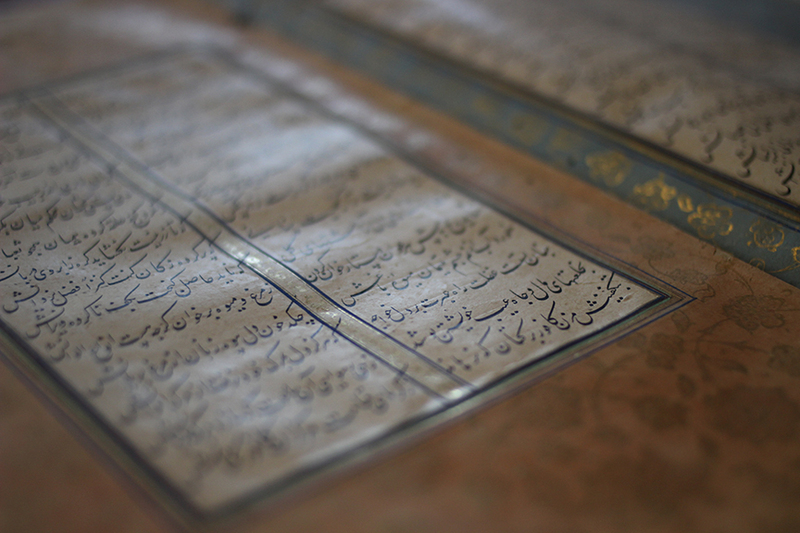 On that fateful day in June, Scott passed along a Persian manuscript from 1515. He’d bought the piece at an auction. A typed note explains the manuscript belonged to the Royal Library of the “Great Mogul” and has the handwriting of Jahangir Mirza and Shah Jahan, “two of the greatest and most noted Emperors of India.” Queen Elizabeth sent Ambassador Thomas Roe to sit in Mirza’s court while Shah Jahan built the Taj Mahal and other architectural wonders. The manuscript eventually was borrowed, never returned, and remained in a palace until the Revolt of 1857 when the house was torn down and its goods confiscated and sold at auction. On Monday, Nov. 13, at 4:30 p.m., Skillman Library will examine the calligraphy as part of the 10th Annual Paul and June Schlueter Lecture in the Art and History of the Book. 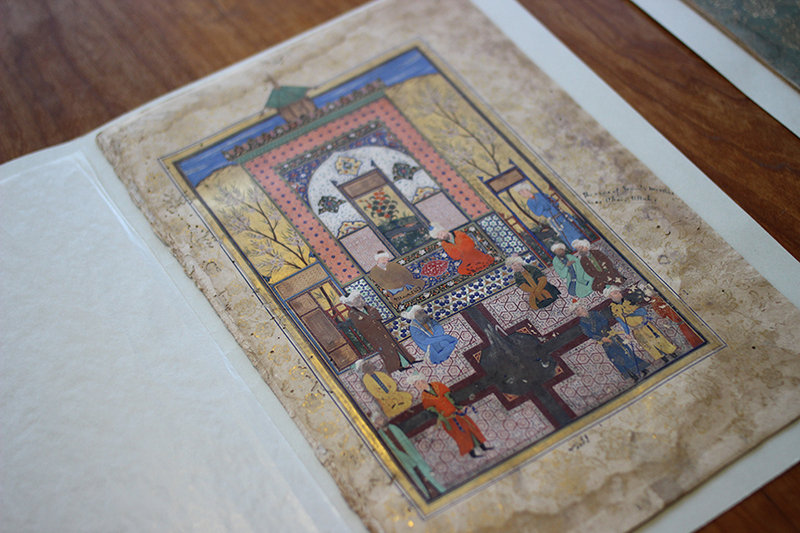 Noted art historian David J. Roxburgh, Prince Alwaleed Bin Talal Professor of Islamic Art History in the Department of the History of Art and Architecture at Harvard University, will speak on the life and times of calligrapher Sultan Ali Mashhadi. The lecture series covers a range of topics associated with the history, culture, production, conservation, and collection of books of all time periods and in all formats. “Doctors Paul and June Schlueter have been long-time, generous supporters of Skillman Library. Paul serves on the executive council of the Friends of Skillman Library, and June was a Dana Professor of English and College provost, and now she’s a volunteer for Special Collections,” says Shaw. The 694-page Lafayette manuscript is a collection of small poems by Jami (1414-1492), a Persian poet, writer, and mystic, who is considered the last great mystical poet of Iran. Jami spent his life in the city of Herat (in present-day Afghanistan) and declined patronage, preferring the simple life of mystic. The manuscript, created 23 years after his death, contains odes, short lyric poems, and quatrains. The manuscript also includes four miniatures, or paintings. One of those paintings is of Jami talking with a philosopher, which is signed by the painter, Mahmud Mudhahhib. Another of the miniatures shows servants preparing a feast in a garden while a beggar with his child looks on. 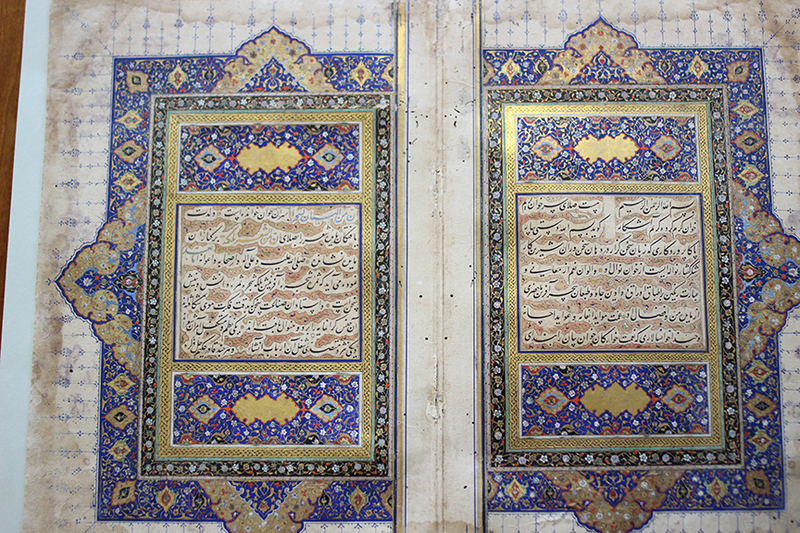 As for the calligrapher, Sultan Ali Mashhadi was considered one of the most eminent practitioners of the nasta‘liq calligraphic script by his contemporaries in late-15th-century Herat, where he enjoyed the patronage of leading artists and citizens. After his death in 1520, later generations continued to hold him in the highest esteem. Learn more about the one who was called “king of the calligraphers” at the Schlueter Lecture on Nov. 13. Additional support for this event comes from Mellon Global Arts Initiative, which is made possible by Andrew W. Mellon Foundation. The lecture is also part of Tapestries Series: Voices with Contemporary Muslim Cultures, an initiative made possible by a grant from Association of Performing Arts Professionals, Building Bridges: Arts, Culture, and Identity, a component of the Doris Duke Charitable Foundation and Doris Duke Foundation for Islamic Art.